Silicon makes up 27% of the earth’s crust. We find lots of uses for it, but what intrigued me is what diatoms do with it. Diatoms are single-celled algae, part of the oceans’ collection of plankton. They make a cell wall (called a frustule) from hydrated silicon dioxide. 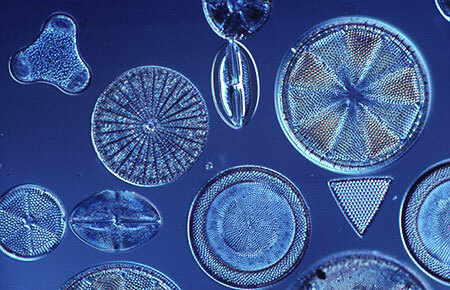 It is estimated that there are more than 100,000 species of diatoms in both salt and fresh water. My quilt depicts two diatoms: a small one that I discharged with bleach, and a larger one that is completely embroidered. More embroidery than I ever want to do again! This entry was posted in Metalloids, View All Elements and tagged Kim B.
Lovely, lovely, lovely. I do love the microscopic organisms.